First, central banks acted without factoring in the foreseeable negative side-effects of their crisis response, notably its exacerbating impact on inequalities. Consider the following analogy. When your doctor prescribes you a drug, you expect her to take into account any important side-effects. When central banks engaged in asset purchases on a massive scale through a programme called quantitative easing (QE), they failed to do just that. The bulk of the additional liquidity injected into the economy was used to buy existing assets such as houses and stocks, thus fuelling price bubbles and favouring asset owners rather than stimulating the economy. Central bankers defended their course of action by arguing that QE was necessary to avert financial meltdown. We show that this claim is false, and that feasible alternatives such as direct money transfers to consumers – also known as helicopter drops – were not seriously considered. Central bankers also claim that making monetary policy sensitive to distributive issues will make it less effective by undermining the credibility of the central bank’s commitment to price stability. In response, we point out that an exclusive focus on price stability is actually in tension with modern monetary theory, which recognizes the need for an integration of policy objectives. If preventing financial meltdown can be a decisive policy objective that trumps price stability in some contexts, why could considerations of inequality never be relevant considerations for monetary policy? The second drawback lies in the increasing dependence of central banks on financial markets, a trend that is sabotaging the effectiveness of monetary policy. Central banks are situated between governments on the one hand and financial markets on the other. While their independence from the former has long been at the heart of monetary theory, we highlight the dangers of their increasing dependence on financial markets. Before the 2007 crisis, central banks were actively facilitating the growth of the financial sector by promoting the use of innovations such as derivatives as well as the increasing securitisation of assets – recall for example the infamous collateralized debt obligations (CDOs) that helped trigger the crisis. They did so both because they believed in self-correcting markets and because they saw a bigger financial sector and liquid financial markets as enhancing the effectiveness of their monetary policy. The catch 22 of this strategy was that they grew dependent on financial markets – consider for instance the so-called ‘Greenspan put’, the fact that markets (rightly) came to expect central banks to prop them up and thus took excessive risks. More surprisingly, perhaps, central banks have failed to reverse course after the crisis. One might have expected them to learn their lesson, and tighten regulation by raising reserve requirements for commercial banks, separating commercial and investment banking, and so on. We discuss two explanations for why this has not happened. First, monetary policy has grown too dependent on commercial banks channelling liquidity to the real economy; second, the size of some commercial banks has made them ‘too-big-to-fail’ for regulators to take any meaningful steps to reign them in. The third and final drawback relates to the role of central bankers as experts. We distinguish two types of central bank expertise: Regulatory expertise, which refers to the know-how of monetary policy-making; and testimonial expertise or the specialised knowledge about the workings of the monetary economy. Our central claim is that central bankers’ discharging their role as regulatory experts often gets in the way of being reliable testimonial experts. This claim is defended by appeal to three standard criteria used for evaluating the capacity of testimonial experts for error correction: transparency of information; the sustained generation of varied criticism; and openness to change one’s beliefs. Modern central banks do not get full marks on any of these: While they have indeed become more transparent (e.g. through the publication of meeting minutes), their communications are tightly controlled and exclusively directed at their regulatory goals. 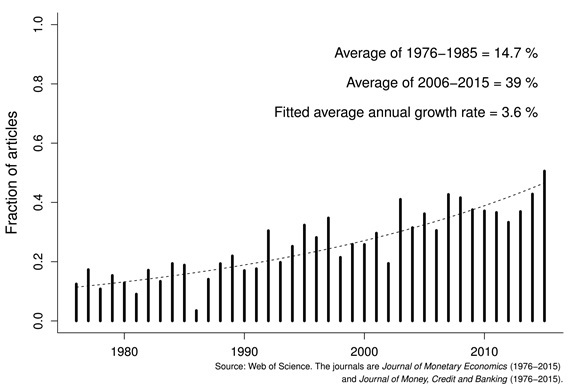 As to the generation of criticism, central banks have become so dominant in monetary policy research circles that work critical of their policy is less likely to be published. As an example, consider the fact that close to 50% of articles published in the top two monetary economics journals today have at least one author who is employed by a central bank (see below). 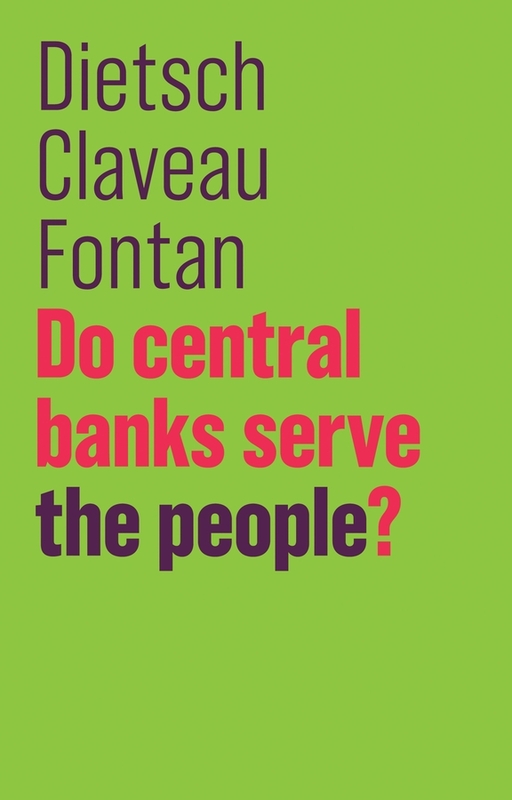 Finally, central bankers are partial participants in the discussion over the possible futures of central banking: their standing as independent and predictable technocrats is at stake. We can hardly expect them to endorse positions that would damage this standing. The book closes with a discussion of possible reforms. These range from changes within the current policy framework – e.g. including a reference to distribution in central bank mandates; tightening regulation – to more radical steps – helicopter drops; 100% reserve banking. We do not explicitly endorse any of these reforms, but we urge our societies to discuss them and have a reform agenda worked out when the next financial crisis hits. We need to overcome the three challenges laid out above and make sure that central banks once again serve the people. We hope this book makes an important contribution to moving this process forward. Peter Dietsch is Professor of Philosophy at Université de Montréal. François Claveau is Assistant Professor of Philosophy at Université de Sherbrooke. 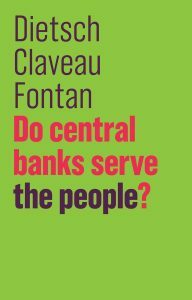 Clément Fontan is Assistant Professor of European Economic Policies at Université catholique de Louvain.